Welcome to the PubMed research guide. Use this special link to access full text resources available through Southern Wesleyan University. What is MEDLINE with Full Text? MEDLINE with Full Text provides the authoritative medical information on medicine, nursing, dentistry, veterinary medicine, the health care system, and pre-clinical sciences found on MEDLINE, plus the database provides full text for more than 1,470 journals indexed in MEDLINE. Of those, nearly 1,450 have cover-to-cover indexing in MEDLINE. Welcome to the PubMed research guide. This guide will point you to the best resources available to you as a student at Southern Wesleyan University. MEDLINE is the largest component of PubMed, created by the U.S. National Library of Medicine (NLM). More than 5,500 journals from the U.S. and >80 other countries are currently indexed. MEDLINE is a comprehensive medical and health science literature database, including access to references from nursing journals. MEDLINE is accessible from a variety of interfaces, including PubMed. Southern Wesleyan University has access to MEDLINE Plus with Full Text through the EBSCOhost interface. However, it is suggested that you use the public search interface here in conjunction with MyNCBI. PubMed content is updated frequently and, as a government resource, the PubMed interface is available to the public. Thus, the search interface will be available to you even if in the future, you are not affiliated with Southern Wesleyan. More information about MEDLINE can be found on the MEDLINE fact sheet. Medline is a database that provides citations to approximately 5,500 health, biology, and biomedical journals. It is produced by the U.S. National Library of Medicine, and articles indexed in Medline are assigned Medical Subject Headings (MeSH) based on content. The content of the Medline database is available through a few different subscription search interfaces-- the one you use at Southern Wesleyan is through EBSCOhost. The Medline database is also a part of what is searched when you are searching in PubMed. PubMed also includes citations that are not in Medline, such as newly published or still in-process articles (that have not been assigned MeSH terms yet). 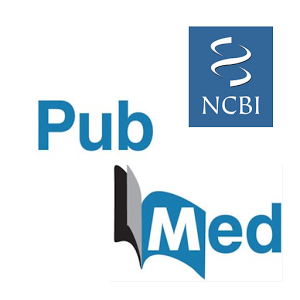 PubMed is a free database maintained by the National Center for Biotechnology Information at the National Library of Medicine. The content found in PubMed and Medline is very similar (but not identical! ): Medline includes approximately 98% of the PubMed data. The major difference between PubMed and Medline is searching these databases. For more information, visit: U.S. National Library of Medicine's guide, "What's the Difference Between Medline and PubMed?". PubMed vs. MEDLINE: What's the difference? Content All the citations that are in Medline are in PubMed. PubMed includes the citations from Medline and some extras (very new articles, articles still in-process). Full-text Includes some full-text articles. Includes links to full-text articles if they are free. Full-text not available? Use the "Check for full text availability" button to find out whether Rickman Library owns the journal electronically or in print. If we don't own it, use the link provided to submit a request to Interlibrary Loan. Use the "Library Holdings" button to find out whether Rickman Library owns the journal electronically or in print. If we don't own it, use the link provided to submit a request to Interlibrary Loan. Zotero -- What is this? There are a few ways to save information to Zotero from Medline. Click here for how to use Zotero with Medline. You can quickly add items to your Zotero library if you already know their PubMed ID. To add an item via one of these identifiers, click the “Add Item by Identifier” button ( ) at the top of the center column of the Zotero pane, type or paste in the identifier and press Enter. Search Limits Include date of publication; type of article; language; subject subset; studies by age, species, and gender of subjects; clinical queries. Include date of publication; type of article; language; subject subset; studies by age, species and gender of subjects. Availability The EBSCOhost version of Medline is only available to institutions that subscribe to the database (like Southern Wesleyan University). PubMed is freely available to anyone-- it does not require a subscription, and you can use it even if you are not affiliated with Southern Wesleyan University. Use this special Medical Search Interface to search MEDLINE with Full Text and CINAHL Plus with Full Text simultaneously.